In this chapter we will discuss about the top level context in Ruby program. We will experiment sending messages with and without explicit receiver. What is top level? 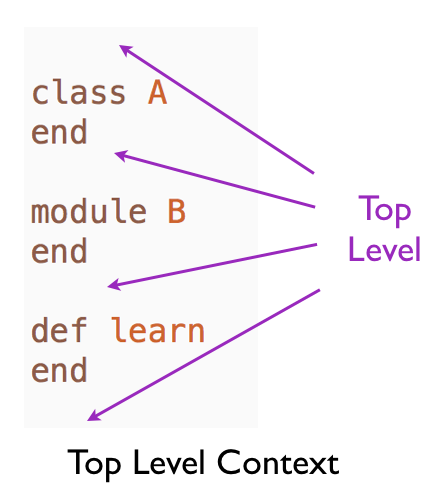 You are in top level when you have not entered into a class, module or method definition. Or exited from all class, module or method definitions. Let&apos;s write a simple program that prints hello at the top level. Can we use an explicit receiver? Let&apos;s ask Ruby for the public instance methods of IO class. The grep searches for methods that has put in its name. The result shows that the puts is a public instance method of IO class. The false argument to the method filters out the methods from the super-class of IO class. The puts is an instance method in IO class. Let&apos;s call the public instance method puts in the IO class. The argument to IO constructor, 1, tells Ruby to print to the standard output. This prints hello to the terminal. Here the $stdout is the Ruby built-in global variable for standard output. Global variables can be accessed from anywhere. In this chapter we discussed about the top level context in Ruby program. We called the puts method using an explicit receiver as well as without providing an explicit receiver. In The Default Receiver chapter, we will see what happens when we call puts without an explicit receiver.